NEW YORK (CNNMoney) -- Three television studios and Dish Network are suing one another over an ad-skipping digital video recorder technology that the satellite TV company debuted earlier this month. Dish's Hopper DVR, introduced May 10, automatically records the entire primetime lineups for ABC, CBS, Fox and NBC. 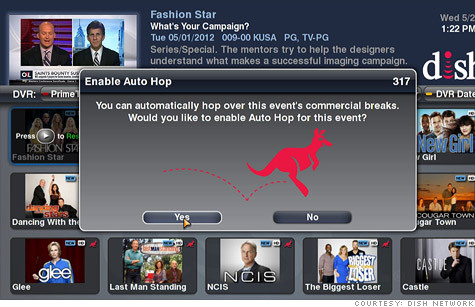 The next day, customers have the option of watching those broadcasts commercial free via the Hopper's "AutoHop" technology. As had been widely anticipated, the parent companies of CBS (CBS, Fortune 500), Fox and NBC all filed lawsuits against Dish (DISH, Fortune 500) in the U.S. District Court in Los Angeles on Thursday night. In a damning court filing, Fox chastised Dish Network for its "bootleg broadcast video on-demand service" that makes "an unauthorized copy" of the entire primetime broadcast schedule. Fox said AutoHop "will ultimately destroy the advertising-supported ecosystem." Fox also claimed that Dish took advantage of its right to retransmit the network's programming, "so that Dish could advertise to the world that 'Dish created commercial-free TV." In its filing, CBS claimed that Dish's AutoHop technology will deprive the broadcaster "of a vital means of payment for their works." If ads will be made invisible to viewers, CBS said advertisers "will not pay, or will pay less, to have their advertisements placed within and around [CBS'] television programming." CBS noted that it generates its highest advertising revenues from its primetime lineup. A spokesman from NBC called Dish's AutoHop an "unlawful service." "Dish simply does not have the authority to tamper with the ads from broadcast replays on a wholesale basis for its own economic and commercial advantage," NBC said. ABC has thus far not filed suit, and a spokeswoman from ABC's parent company Disney (DIS, Fortune 500) declined to comment on whether the broadcaster would join its rivals. Dish disagrees with the lawsuits. The company said that through retransmission fees the networks charge to Dish, its customers are essentially paying for what would otherwise be free broadcasts that they could get on broadcast TV or Hulu. "Consumers should be able to fairly choose for themselves what they do and do not want to watch," said David Shull, Dish's programming director. "Viewers have been skipping commercials since the advent of the remote control; we are giving them a feature they want and that gives them more control." In Dish's counter suit, the satellite provider is asking the U.S. District Court in New York to rule that AutoHop "does not infringe any copyrights that could be claimed by the major networks, and that DISH, while providing the AutoHop feature, remains in compliance with its agreements with the networks," according to a company statement. Meanwhile, CBS, News Corp.'s (NWS) Fox and Comcast's (CMCSA) NBC have all rejected Dish's ads for the Hopper. This is not the first -- and likely not the last -- time that broadcasters have battled new digital video recording technology. For instance, on Wednesday, several local New York stations, including the local Fox, PBS and Univision channels, filed suit against a new technology called Aereo. Aereo would allow consumers to watch and record broadcast TV online by hooking up a small antenna to an Internet connection. The broadcasters are seeking an injunction against Aereo, claiming they are allowing consumers to bypass cable retransmission fees.